Proove Biosciences sponsors an educational symposium at the 31st Annual American Academy of Pain Medicine conference in National Harbor, Maryland. Genetic Testing can lead to safer and more effective therapy. - Former AAPM President, Lynn Webster, M.D. 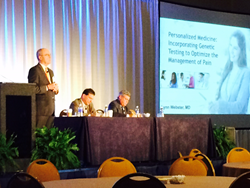 Proove Biosciences, a commercial and research leader in Personalized Medicine, is excited to announce the success of their commercially supported symposium, Personalized Medicine: Incorporating Genetic Testing to Optimize the Management of Pain, at the 31st Annual American Academy of Pain Medicine conference in National Harbor, Maryland on Thursday, March 19th, 2015. The symposium’s faculty, which consisted of former AAPM President Lynn Webster, M.D., former Florida Society of Interventional Pain Physicians’ President Sanford Silverman, M.D., and local D.C. pain physician Abraham Cherrick, M.D. presented supporting data for Proove’s proprietary genetic tests; tests that are designed to objectively guide clinical decisions in screening for opioid contraindications, improve medication efficacy, and avoid adverse drug events. Our Mission is to Change the Future of Medicine. Proove is the proof to improve healthcare decisions. We seek to realize a future when clinicians look back and wonder how they could’ve ever prescribed medications without knowing how a patient would respond. With offices in Southern California and the Baltimore-Washington metropolitan area, the Company is the research leader investigating and publishing data on the genetics of personalized pain medicine with clinical research sites across the United States. Physicians use Proove Biosciences testing to improve outcomes – both safety and efficacy of medical treatment. From a simple cheek swab collected in the office, Proove performs proprietary genetic tests in its CLIA-certified laboratory to identify patients at risk for misuse of prescription pain medications and evaluate their metabolism of medications. For more information, please visit http://www.proove.com or call toll free 855-PROOVE-BIO (855-776-6832).